So in the spirit of the new year, I'm trying new hairstyles for curly hair and am enjoying it. Curly Nikki has a bun tutorial on her blog and I decided to try it last week and really liked the results. 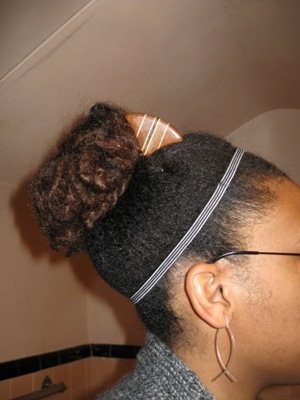 It was so easy to do and each day I saw my bun magically expand. 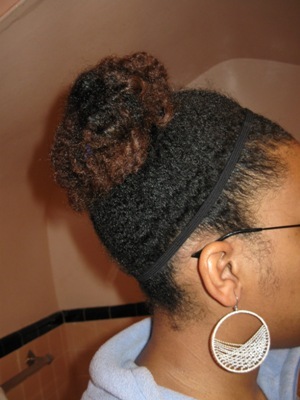 Curly Nikki's uses Deva Care Conditioner, and shea butter as a sealant. Click here to try some new hairstyles for curly hair. So this is the first day and my bun was normal sized. What was insane was how wavy my hair was. I didn't think I could ever get my hair as wavy as it is in the picture; I guess the stretching of my curly hair did that. Instead of a hard boar bristle brush, I used a very soft one. Today, I felt like a blue headband and some swingy earrings. I'm really into accessorizing now since I've been wearing my hair up. Here is my hair the third day and I added a hair stick from Ron Quattro. I think it's now my favorite. I'm growing a "ridonculous" collection. I guess now I'm just replacing one obsession with another: Long hair, with hair accessories and jewelry. 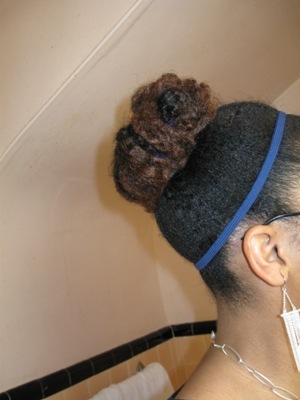 To try this bun style for yourself, click here to go to Curly Nikki.